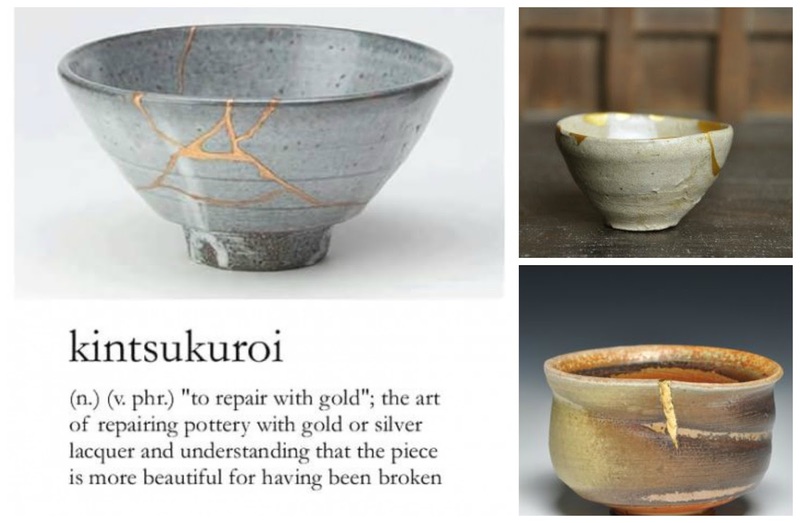 kintsukuroi (sometimes known as Kintsugi) is a beautiful thing.From what i have read, it's origins is from Japan. Broken pottery is repaired, that's all it is. But instead of being repaired with glue, it's repaired with lacure that contains gold or other desirable metals. The outcome of these repairs is something truly beautiful. Instead of throwing away something that is broken, the pottery is turned into something more beautiful, it is no longer a piece of pottery, it's art and it's beautiful. The principles of kintsukuroi can be applied to us as people, that what I was told when I first learnt about this. Just because a person is broken and shattered does not mean we should throw them away and disguard them. Instead a broken person should be helped, put back together and made into something... someone... beautiful. I know personally I don' see myself as beautiful, in my eyes I'm too far gone, I'm a burden who will never make a difference, I'm a person who has got so lost in her own head that she can't get out, I can't help myself so how on earth can I help other people? In my eyes I will never be enough and I will never be beautiful. I'm not talking about visual beauty, I'm talking about the type of beauty that really matters, internal beauty. But maybe, just maybe I could be made beautiful. Maybe I could be put back together and be beautiful. Maybe after everything I'm gong through I will be made beautiful through that. By enduring the hardship my personality will be changed for he better, my perspective will be changed for the better. Maybe by being broken I will be made beautiful.